Remember My Post reviewing the Yanni Voices CD and DVD I received? Well, it's time for the PBS Specials! Are you ready?! Here in Maryland, you can click HERE for the showtimes on MPT. For those of you who live elsewhere, you can click HERE to locate your locate your local PBS station, and even search for showtimes like I did above. 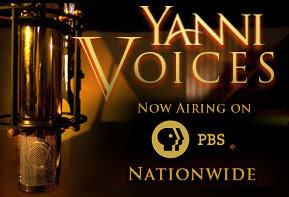 If you have never listened to Yanni's music before, now is the time. I never had listened to him before, but after this, I think I will. This is a great CD and DVD and the PBS Special is not to be missed! Special thanks to One 2 One Network for providing me with some new music!